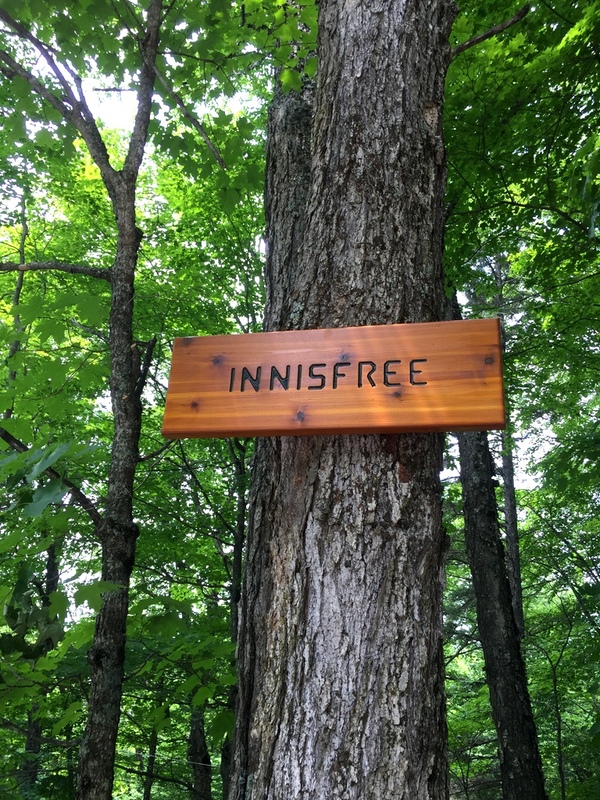 Welcome to Innisfree, a unique 600 sq. 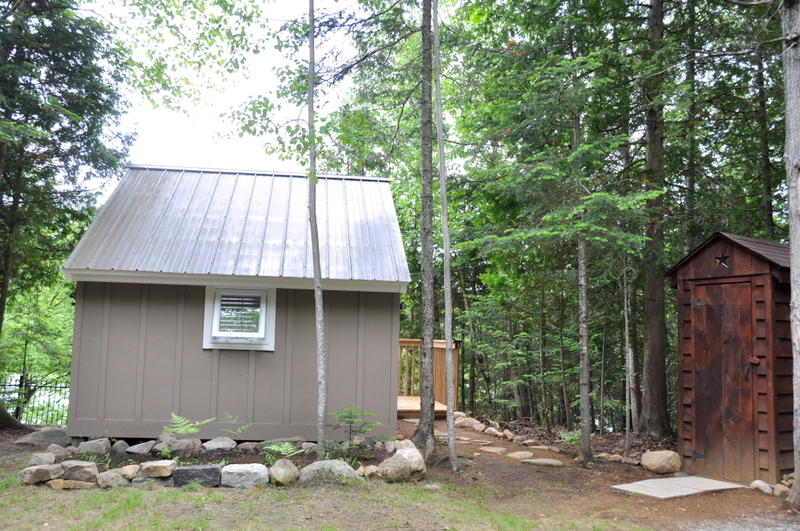 ft. “on-the –water” refuge located on crystal clear Oxbow Lake. 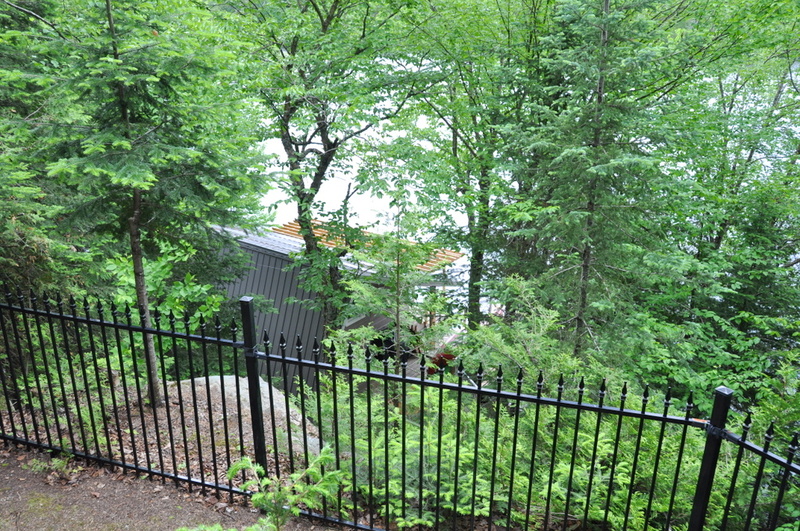 Nestled in the heart of beautiful Muskoka, close to the Muskoka 70.3 Half Ironman course, it is the quintessential spot for training and racing for these iconic events! 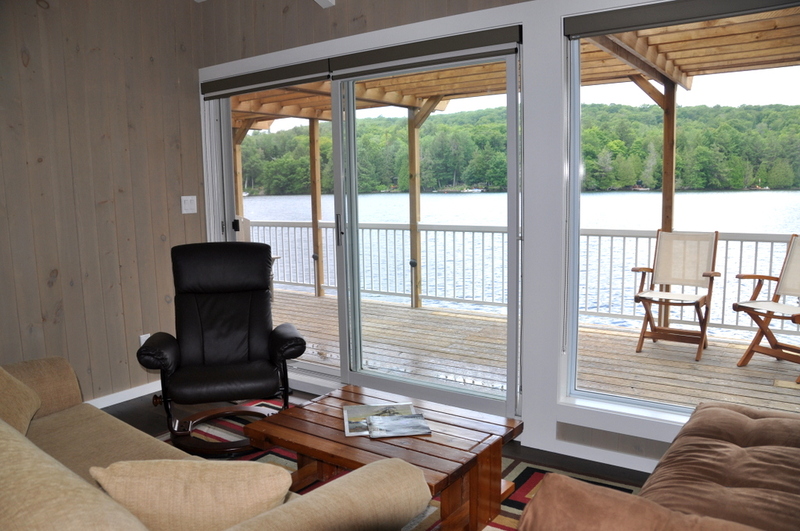 Whether you are athletically inclined or searching for a low maintenance tranquil retreat, you won’t be disappointed. 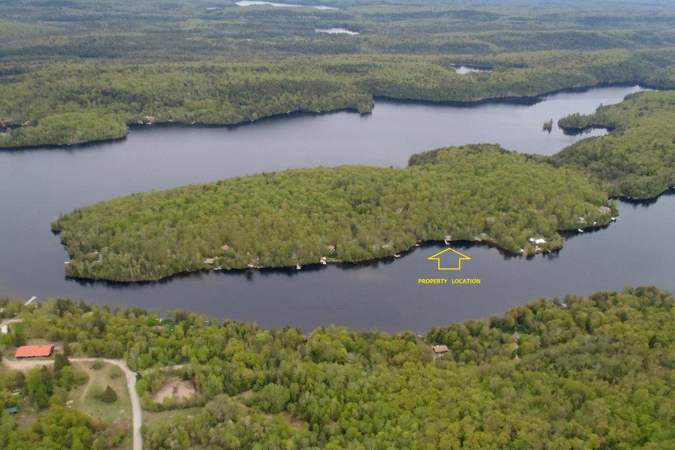 Once you are off of the main highway, you will feel the hustle and bustle of the city slip away as you travel along gently rolling Limberlost Road. 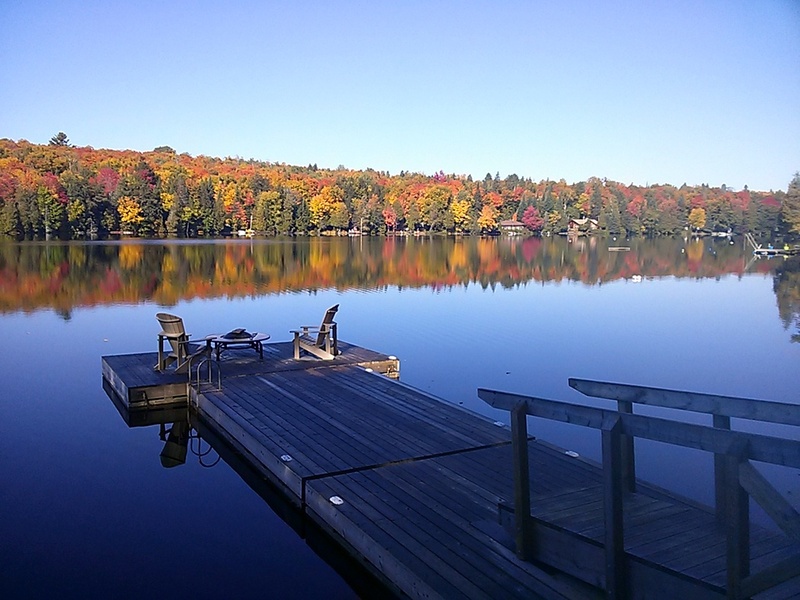 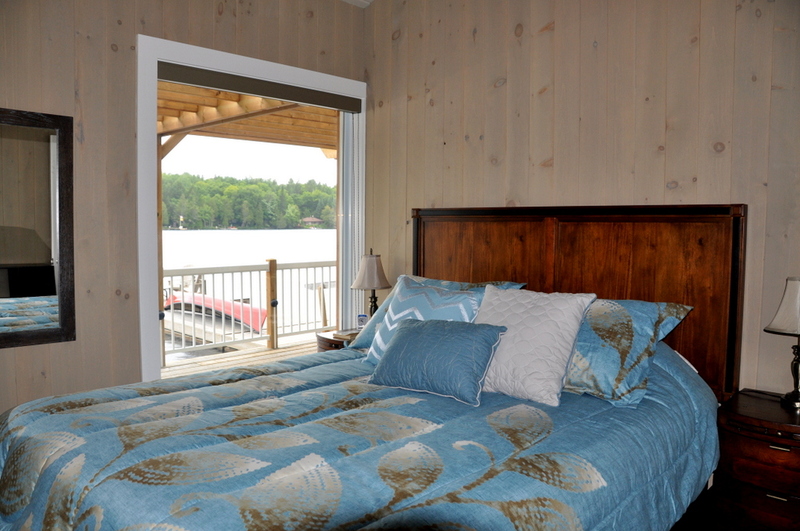 With a few turns off of Limberlost you will have arrived at your peaceful destination! 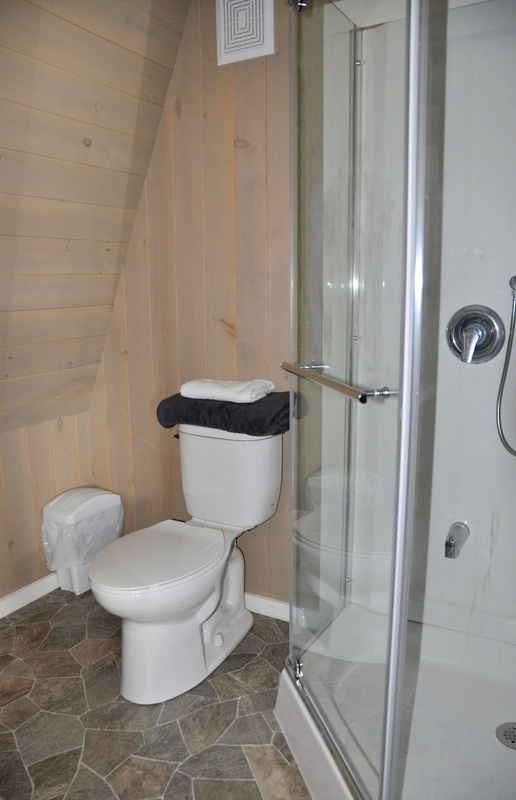 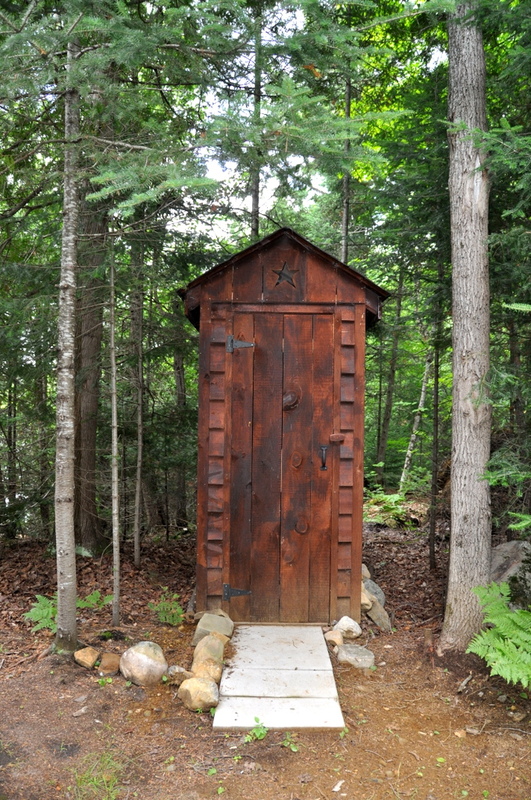 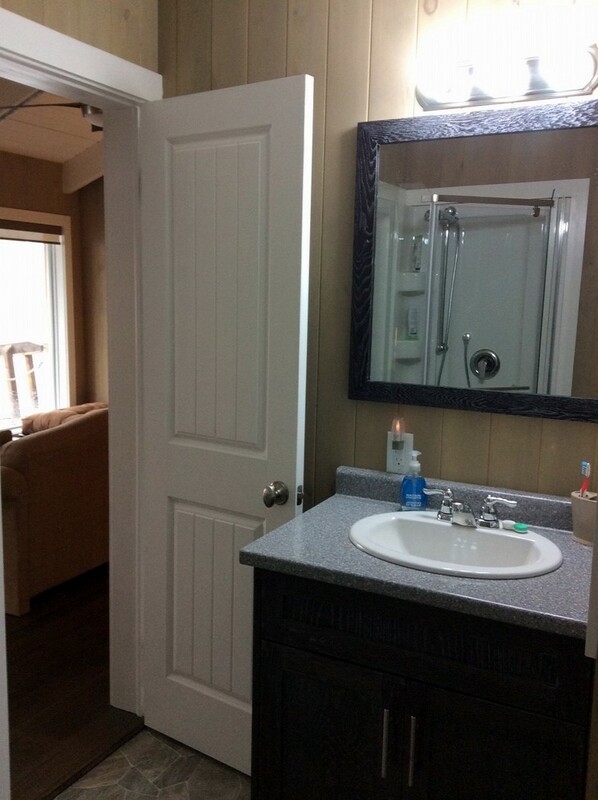 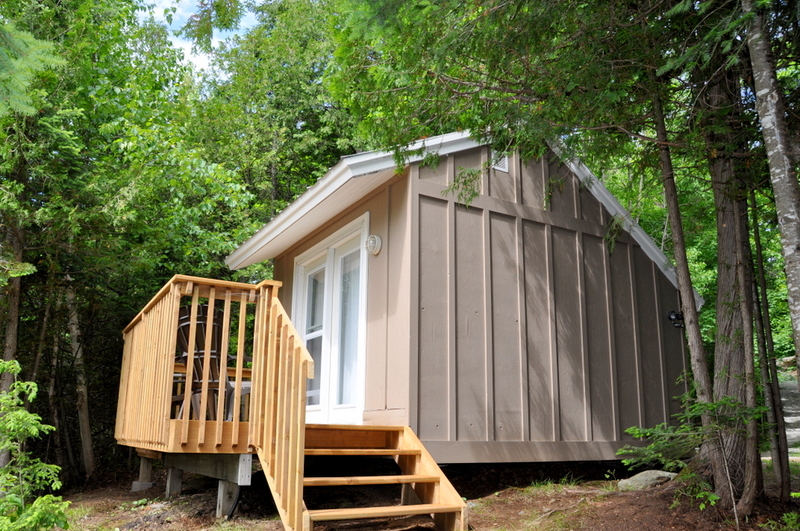 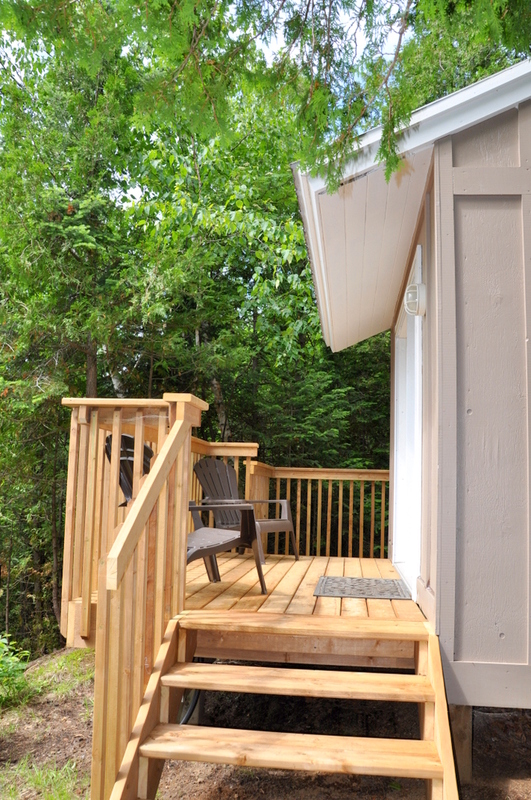 There is a newly renovated bunkie at the top of the 1 acre property with a queen bed, a pristine outhouse nearby and a small deck with a tree top view of the lake. 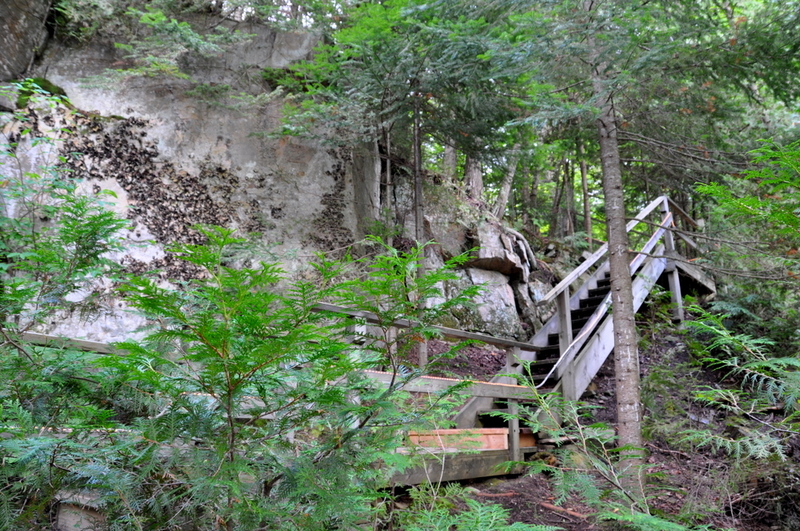 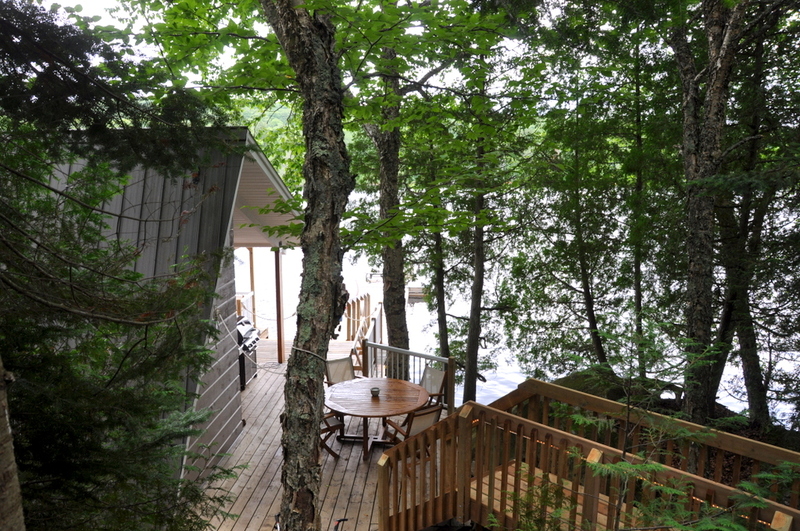 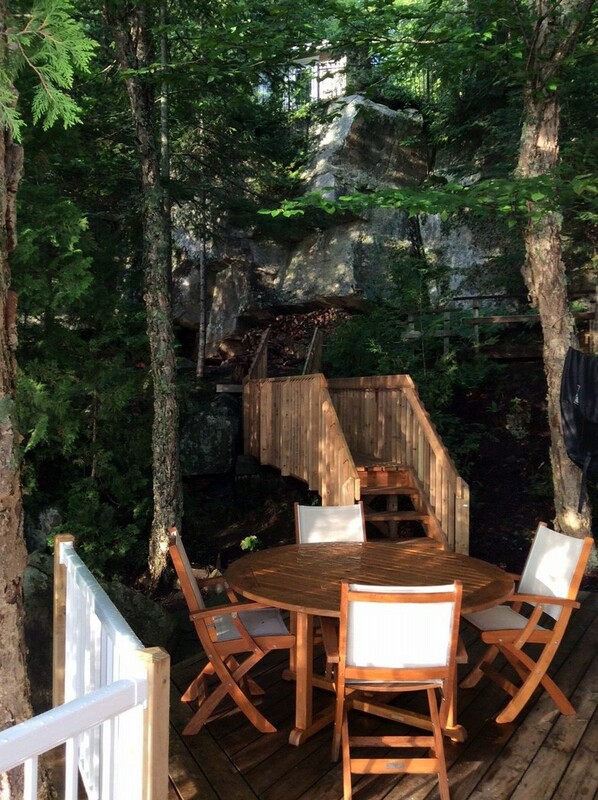 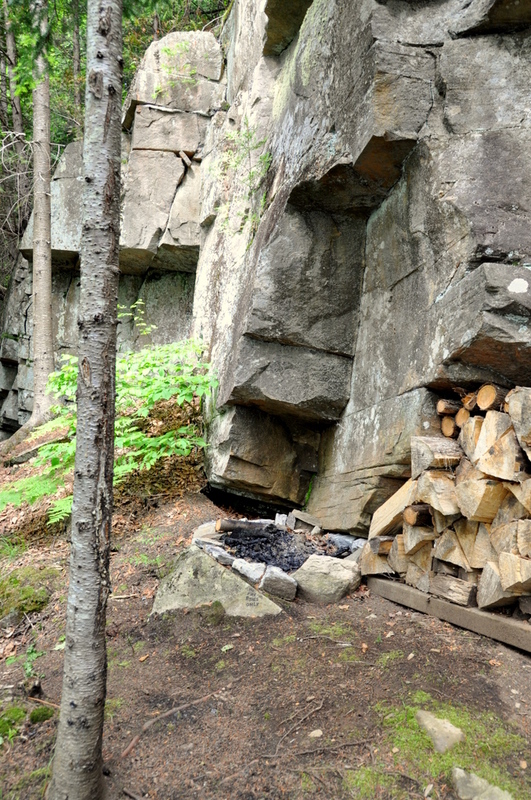 A picturesque “twinkle lit” staircase, tucked into a granite rock wall and shaded with trees, takes you down to the newly renovated, immaculate one bedroom cottage, literally sitting on top of the lake, truly one with nature. 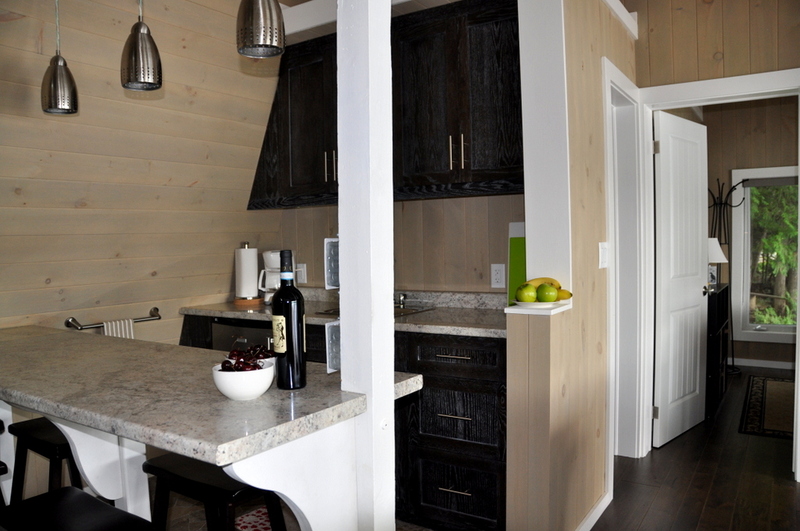 With cathedral ceilings, tongue and groove pine walls and engineered wood floors, there is a sense of subtle modern meets cottage casual. 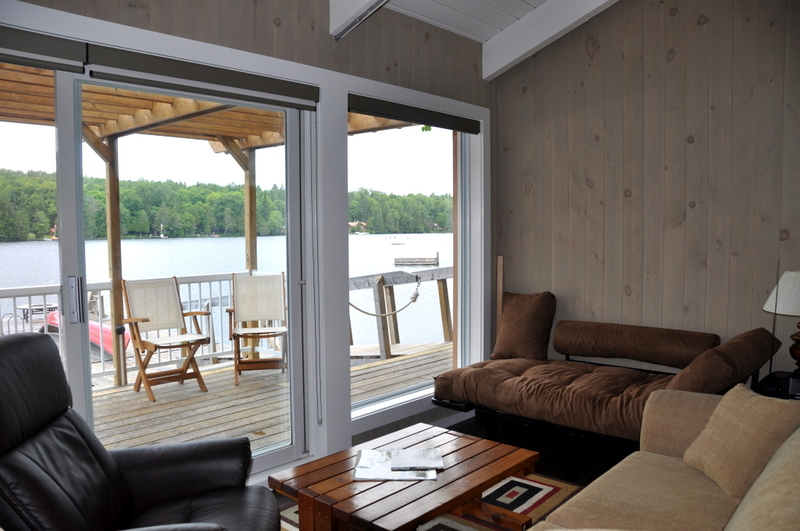 The kitchenette and living room are open concept making this living area compact but roomy with large lake facing windows bringing in ambient sunshine and beautiful lake views. 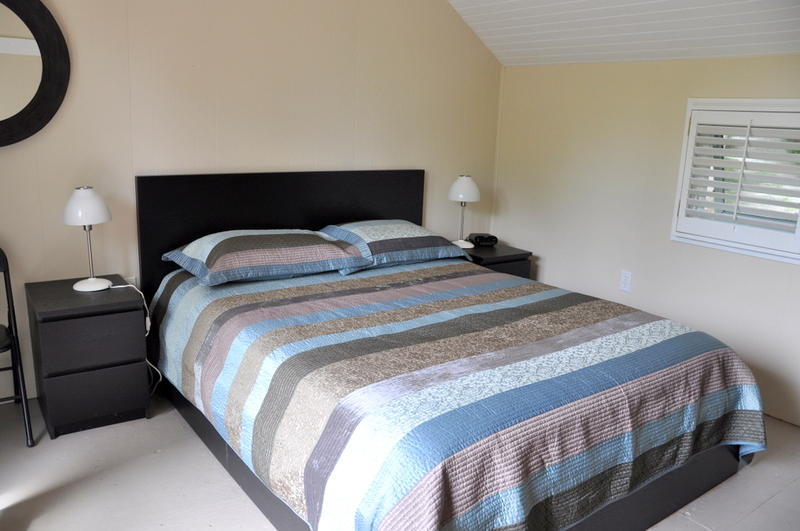 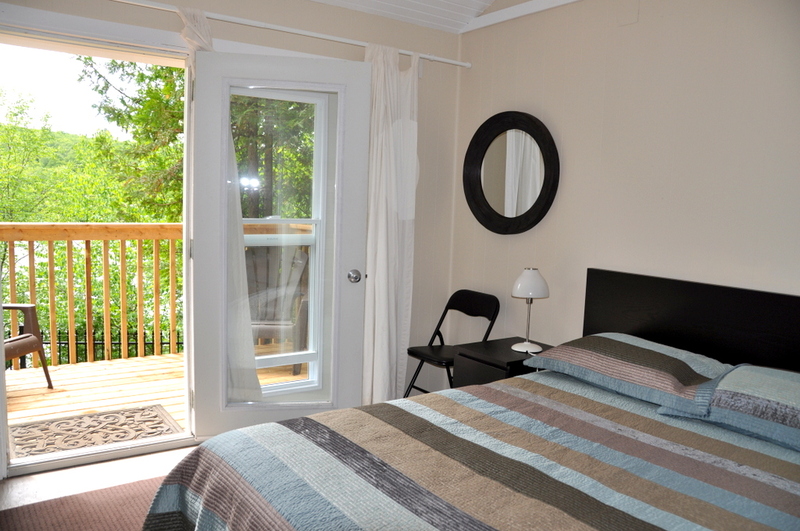 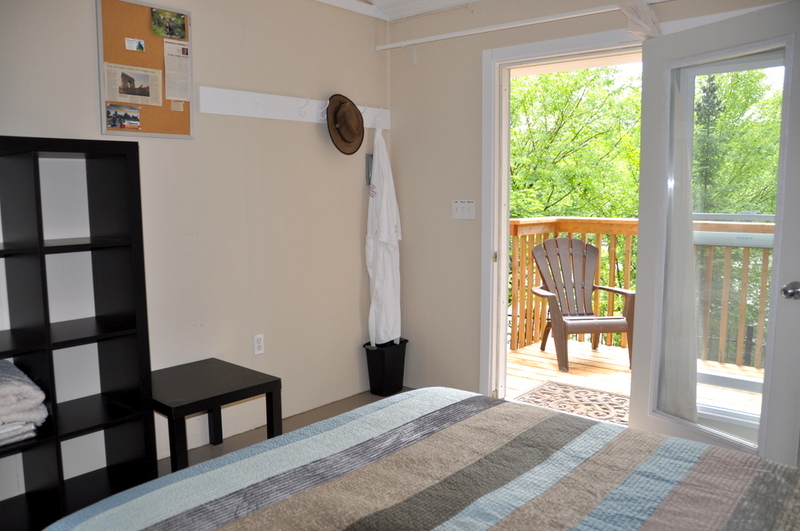 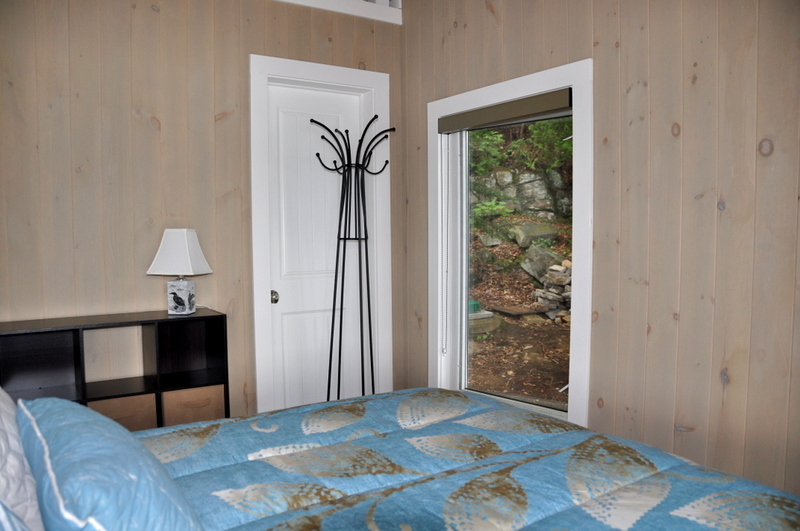 A bright and comfortable bedroom and 3-piece bathroom complete the interior of the cottage. 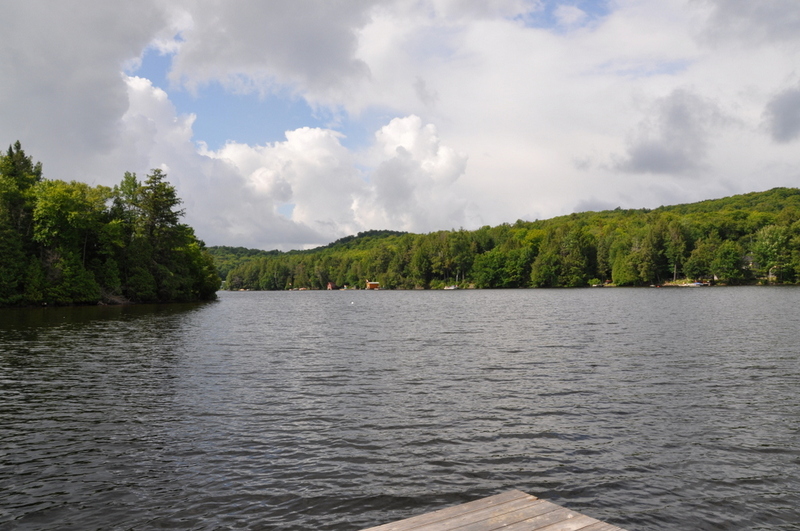 The waterfront is 185 ft. of natural shoreline and the depth at the end of the dock is 10 feet, perfect for diving and swimming. 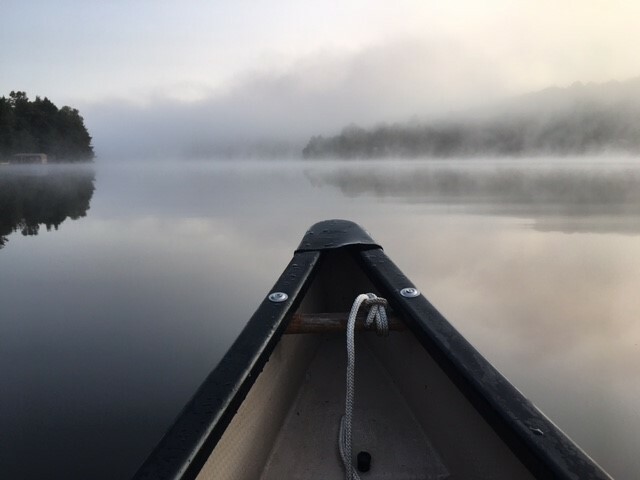 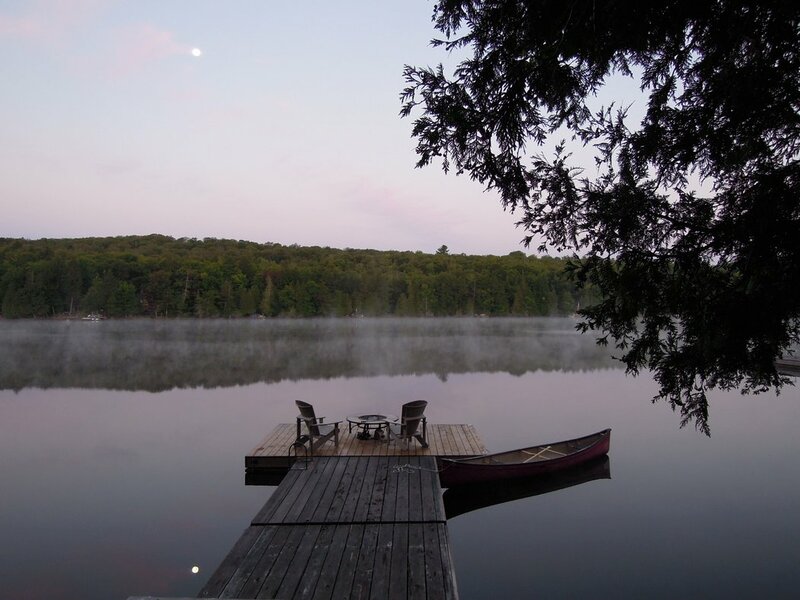 Take the canoe out in the early morning hours and enjoy the tranquility of this relatively quiet lake and then settle back in (for some of you a swim, bike and run may be in order first!) 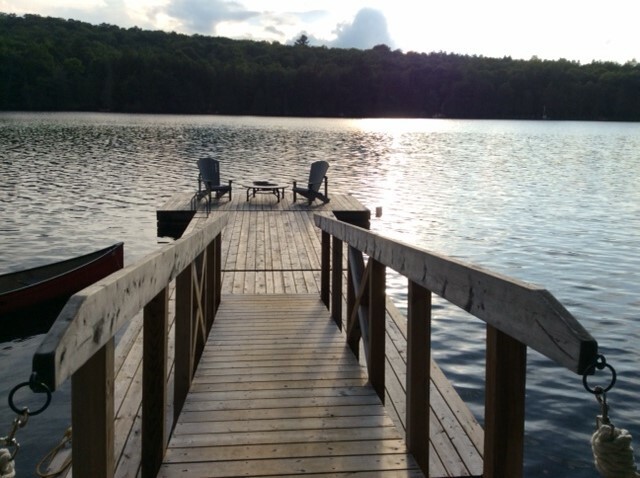 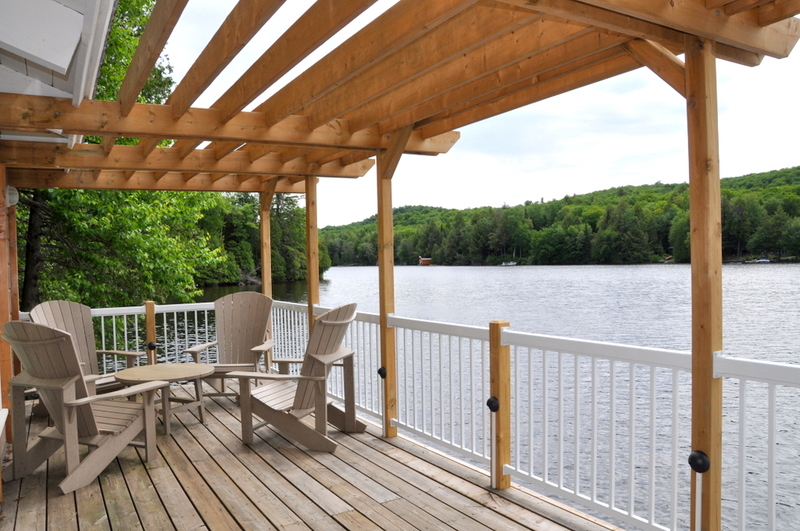 on the dock with your favourite beverage and book and soak up the sunshine from mid-morning ‘til sunset. 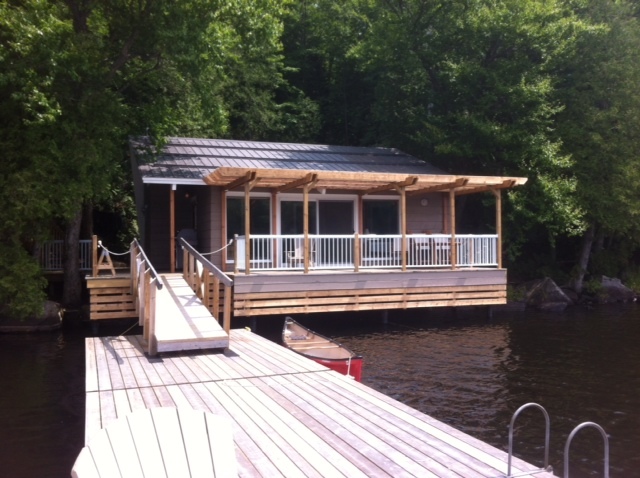 The “piece de resistance” is the large wrap-around deck! 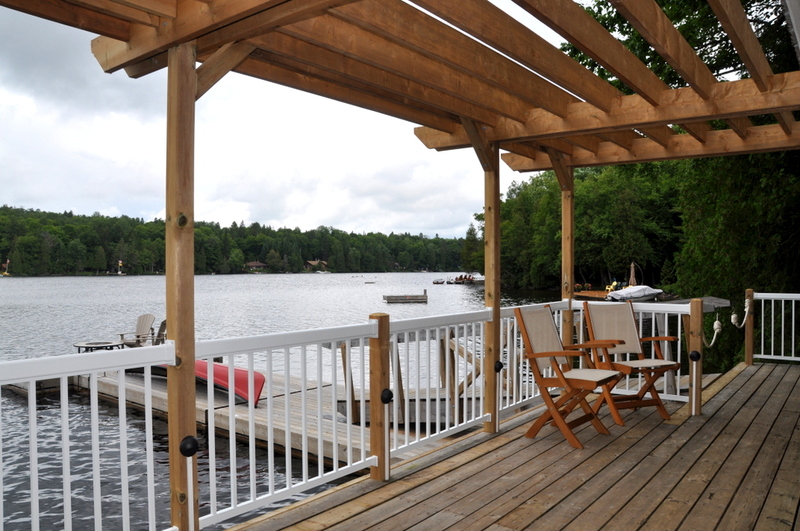 The waterfront (literally hanging out over the water) section has a pergola and the side has an open outdoor dining area with the stunning granite wall as your back drop. 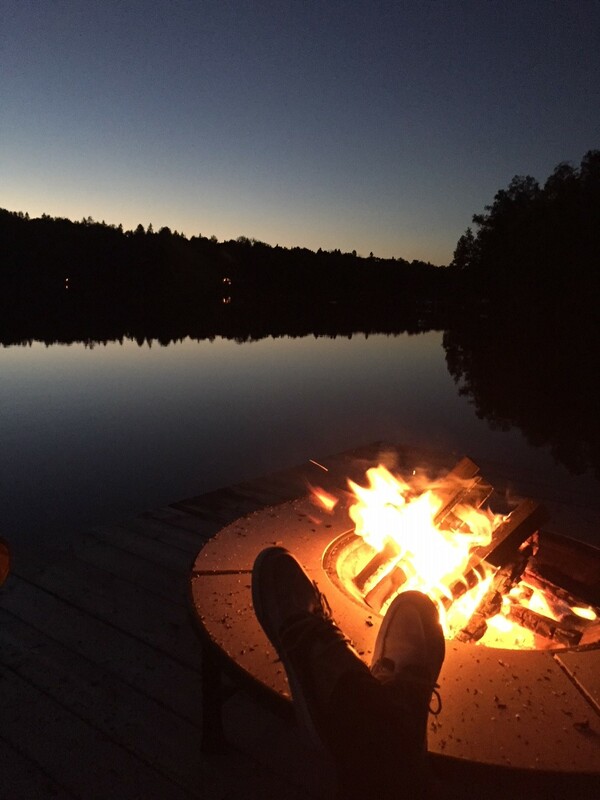 After a leisurely BBQ dinner, gather round the fire bowl at the end of the dock and take in spectacular sunsets. 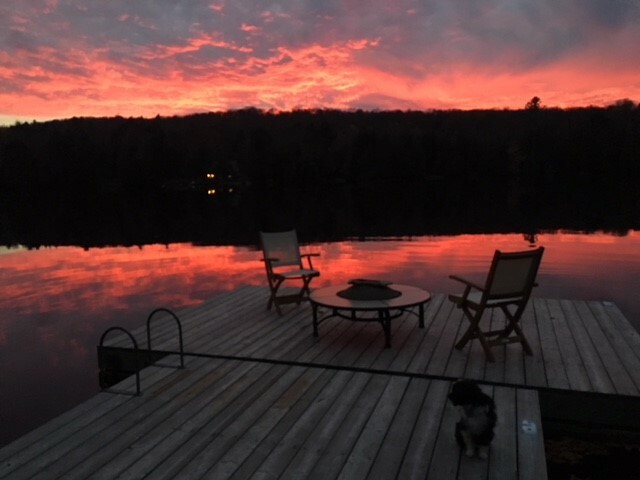 LOCATION: About 2.5hrs from Toronto. 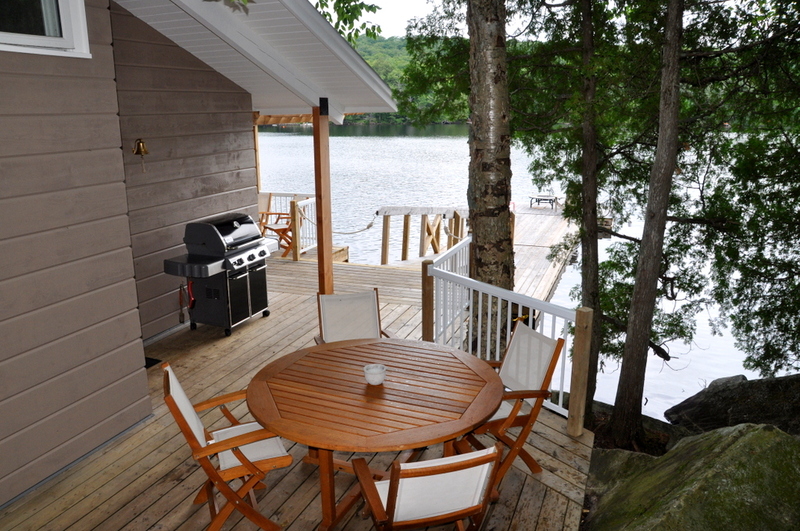 Just 20 minutes to the town of Huntsville for shopping, gas, LCBO, dining, entertainment and most all amenities. 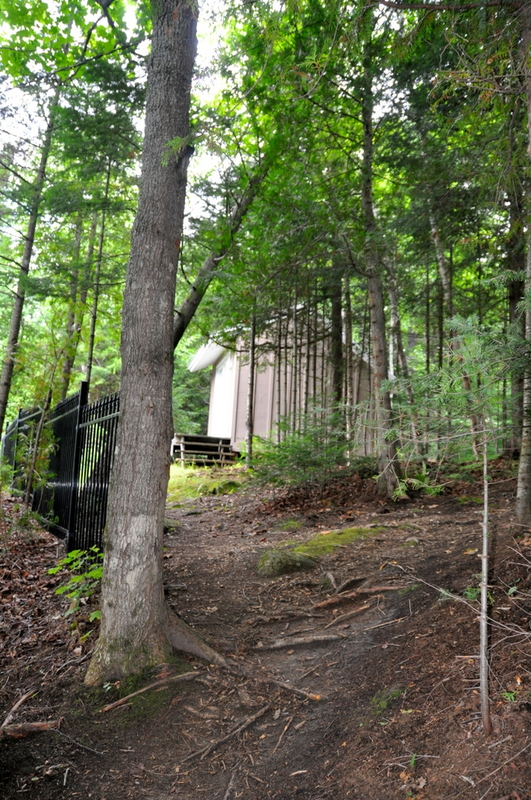 Olympia Sports Camp is close by for those who have kids enrolled and want to be close by. 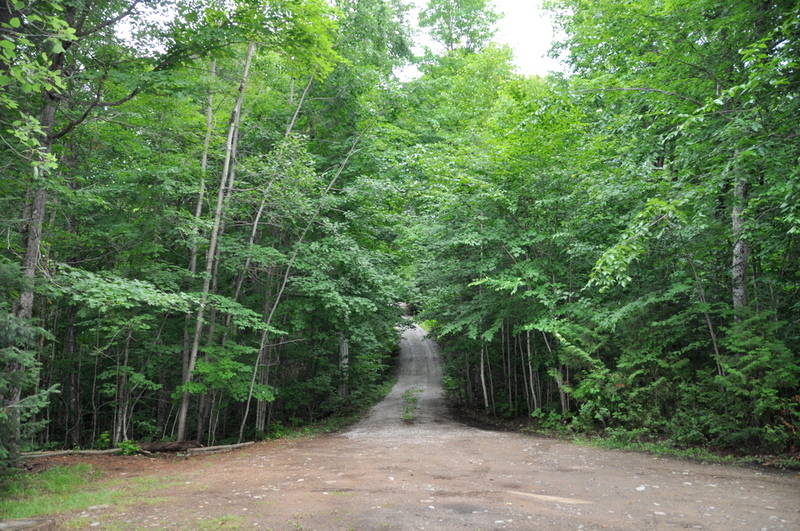 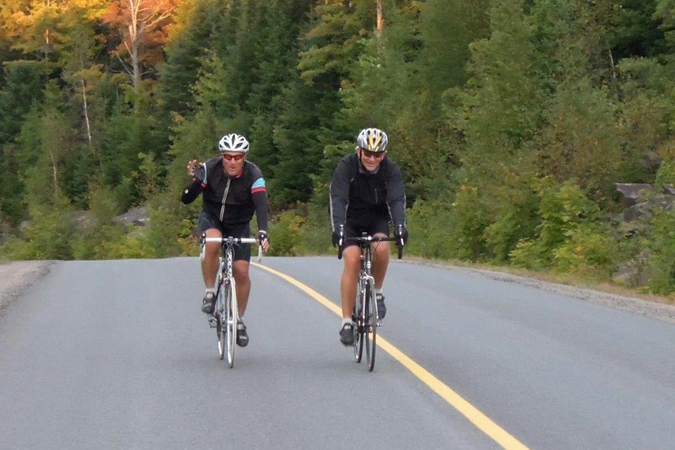 Limberlost Road on the way in from HWY 60 is great for road riding for those who like cycling. 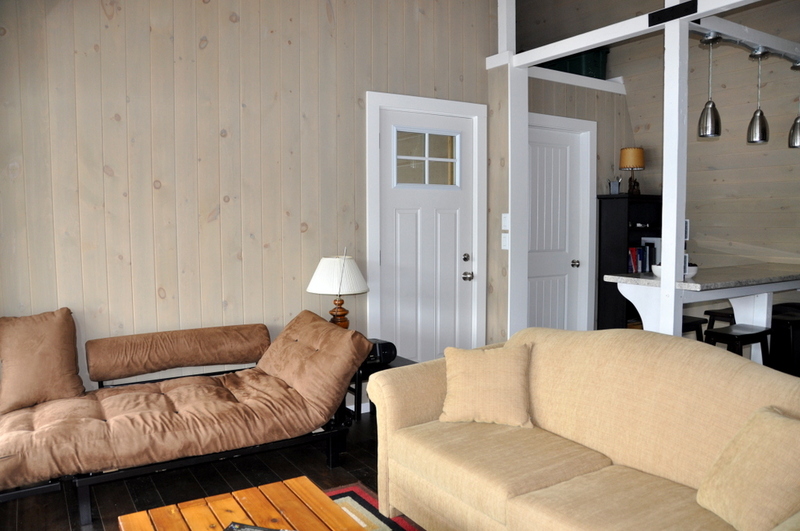 Pet upon approval, no smoking, maximum number of occupants is 4, bring own linens and towels, bring own drinking water, noise restriction after 11 PM.